Laura and Merryn are on a mission to improve lives across the world by providing health education that can be accessed by anyone, from anywhere, at any time. Future proof your health to live a life you love! A lifestyle Podcast designed to empower you on your path to vitality, freedom and purpose. Brought to you by Merryn Thomae (Endocrinologist & Internal Medicine Physician). 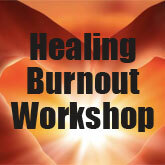 A fantastic workshop designed to start you on your journey to healing burnout and creating a life you love!